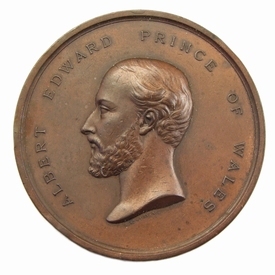 A bronze medal, struck to mark the Service of National Thanksgiving for the recovery of Edward, Prince of Wales from typhoid fever, dated 27 February 1872. 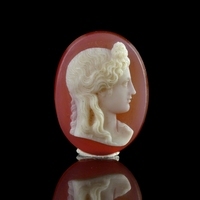 Made by Joseph Shepherd Wyon & Alfred Benjamin Wyon. Signed: J.S. WYON SC. 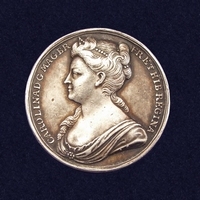 on obverse; J.S. & A.B. WYON on reverse. Obverse: Head of Albert Edward, Prince of Wales left. 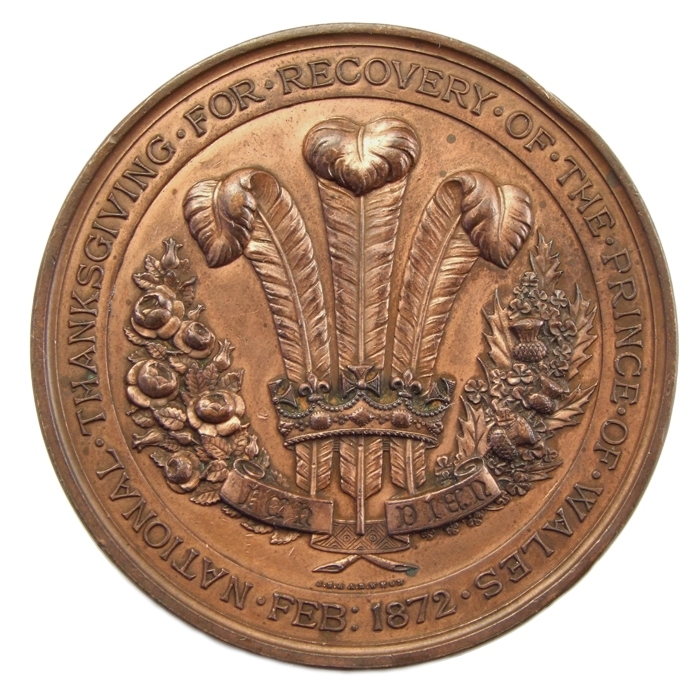 Reverse: The Prince of Wales' Feathers badge with his motto 'Ich dien'. Legend: NATIONAL. THANKSGIVING. FOR. RECOVERY. OF. THE. PRINCE. OF. WALES. FEB:1872. Albert Edward (1841-1910), Prince of Wales, was the eldest son of Queen Victoria and Prince Albert. The Prince of Wales contracted typhoid fever in December 1871 and nearly died as a result. A national thanksgiving for his recovery was held at St. Paul's Cathedreal on February 27, 1872.